Includes: 35 Count Weeks Dye Works linen, Dinky~Dyes Silk, needle, felt, cardboard, floss and pin. Includes: 30 Count WDW Linen, NPI Silk, lining, floss card, gold ribbon, 2 large & 1 small jump rings, 1 large and 2 small beads, cardboard & batting. 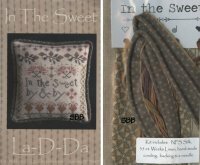 Includes: 35 Count WDW Linen, NPI Silk, hand-made cording, backing fabric & needle.